In 1864 Queen Victoria reviewed her volunteer troops on the heath and an edition of The Illustrated Times of that year featured the event and published several illustrations. As a result of this occasion the local inn was named 'The Volunteer', later being renamed 'The Villagers'. The operation was on a considerable scale with a grandstand on Rosemary Hill (then treeless!) and an area for spectators along Littleford Lane. The attacking troops were to come from Albury against the defenders formed up just to the East of what is now the cricket ground (behind Little Orchard and Top Cottage). Indeed, a contemporary print includes Top Cottage in a view from the spectator stand. Alas the proceedings got somewhat out of hand and there were a number of accidents caused by the audience getting between the two sides, and finally, whilst firing a volley one man had left his ramrod in the barrel and this shot and killed the vicar, the Rev. W Earle. The Villagers remains almost alone on a quite lane through mixed woodland. It is the perfect place to eat meet or get merry. 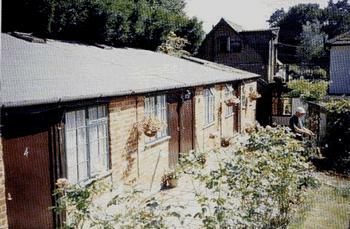 Alternatively, it can be used as a base to go on one of the many fine walks through the beautiful Surrey countryside. Whichever your preference you will be assured that the welcome that awaits you is as warm as the log fires. Telephone 01483 893152. 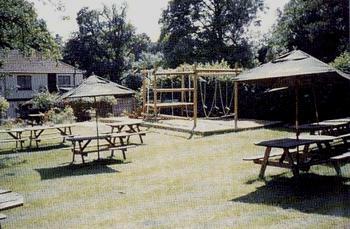 Above can be seen the magnificent beer garden that overlooks the woodland, which is open all year round. There are even heaters that provide warmth for those who love dining alfresco. 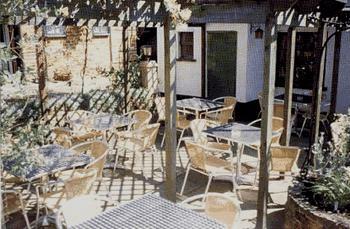 Below is a picture of the patio area. Why not make a weekend of roaming the Surrey walkways and stay in one of the four comfortable chalet-style letting rooms that are shown in the picture below.